One of my favorite dinners is breakfast for dinner. 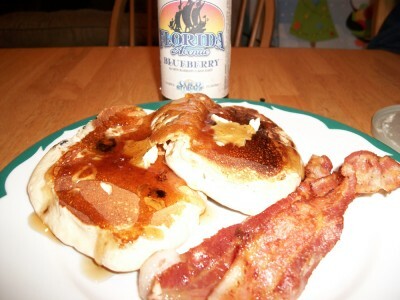 After a long day at my day job, I can’t resist some comfort food like blueberry pancakes and bacon. It gets even better when you throw in some beer! When I saw this recipe for Blue-Beer-y Pancakes, over at CraftBeer.com, I ran out and to the store and picked up the ingredients. I couldn’t wait to try it! My version is definitely based on the Blue-Beer-y Pancakes, but I have slightly modified it. My version is slightly simpler, perfect for the culinary connoisseur that’s in a rush. Mix together the pancake mix with beer, based on the directions on the box. Add in blueberries. The amount of blueberries you add in can vary, depending on how juicy delicious you want it to be. Serve with butter and blueberry syrup (if you don’t think that’s over doing it). A few strips of bacon on the side, doesn’t hurt. There’s only a hint of the alcohol in the pancakes, just enough to add a little bit of flavor. Overall, a really simple recipe, that tastes delicious. Can be made with an berries and any berry ale, I’m thinking strawberries and Abitia’s Strawberry Harvest Lager next. What’s your favorite beer influenced recipe?